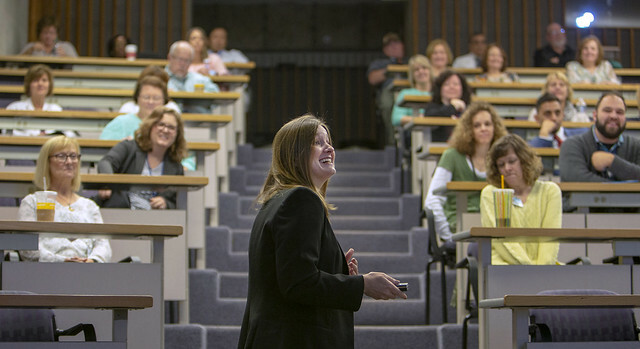 Physicians from across Pennsylvania discuss best practices for treating opioid use disorder during the first Project ECHO session at Penn State College of Medicine. For patients suffering from opioid use disorder, and for the physicians in small towns across Pennsylvania who are their first level of care, Project ECHO offers hope. The effort aims to give primary care physicians the tools they need to treat the growing group of Pennsylvanians addicted to opioids—many of whom live in regions with no specialized addiction resources. It’s a win-win: patients get a doctor who can treat them close to home, and physicians get to expand their knowledge, their professional network and their relationship with their patients. The concept comes from a physician at the University of New Mexico who wanted to shorten the wait list at his gastroenterology clinic. Now, more than 220 institutions around the world use Project ECHO for at least 90 disease topics. And Penn State Health researchers hope to influence them all. Marissa Aulenbach, right, a board-certified music therapist at Penn State Children’s Hospital, plays her guitar while registered nurse Lauren Libhart tends to 4-month-old Caden Hoover during his stay for a heart condition. After 12 days in the hospital, Hershey resident Anita Heckert could tell her optimism was waning, so when her occupational therapist suggested music therapy, she was game. “To have someone come and spend time with me that didn’t involve needles, drawing blood or an MRI was very appealing,” said Heckert who was in Penn State Health Milton S. Hershey Medical Center for complications due to colon cancer. As Jan Stouffer, board-certified music therapist with the Music Therapy Program at the Milton S. Hershey Medical Center, quietly played guitar, she gave Heckert an ocean drum to play. Hundreds of small ball bearings in the drum combined to sound like gentle waves at low tide coming across the sand—and transported Heckert back to a happy day years ago when she and her sister, each with their small sons, visited Assateague Island and frolicked on the beach with six wild ponies splashing nearby. As Stouffer encouraged her to remember the strong and faithful mother she had been in that moment, she reminded her, “That person still exists—you are that person.” The encounter served as a turning point in Heckert’s emotional outlook. 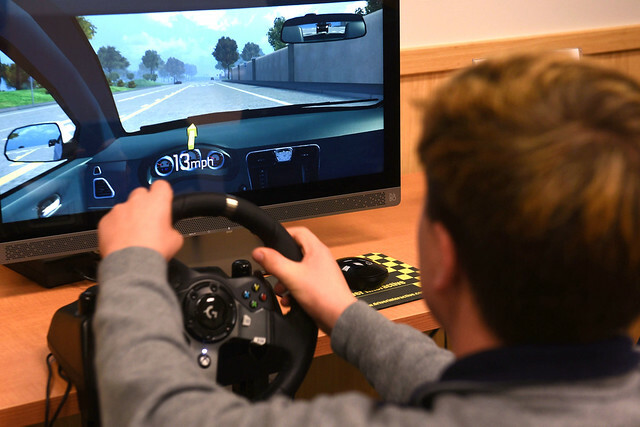 A teen boy experiences the dangers of distracted and impaired driving through the simulation-based program One Simple Decision. Penn State Children’s Hospital pediatrician Dr. Erich Batra and his daughter had a special date with an important goal last fall—to drive safer and smarter. The pair were part of the first Alive at 25 driver’s awareness course presented by the Penn State Trauma Community Outreach team. Designed by the National Safety Council, the course teaches drivers age 15 to 21 and their parents strategies for keeping safe on the road and tackles decision-making and responsibility-taking. See more photos of the Alive at 25 course on Flickr. Captain Jennifer Fan of the Center for Substance Abuse Prevention discusses new substance abuse prevention initiatives at Penn State College of Medicine’s Addiction Symposium. A startling 13 to 16 people die each day in Pennsylvania due to opioid overdose, among the more than 70,000 Americans who succumbed to the epidemic in 2017, according to the Centers for Disease Control and Prevention. That gives Pennsylvania the dubious distinction of being ranked near the top of opioid-related death rates in the U.S.
That’s why the clinicians, researchers and administrators with Penn State Health and Penn State College of Medicine have united to fight the opioid crisis. Their weapons are evidence-based clinical treatment, research and education, and they are aiming at every phase of the problem ― from pre-addiction through treatment and recovery.